New York (TADIAS)- Our next highlight for Women’s History Month series features Grammy-nominated singer and songwriter Wayna. 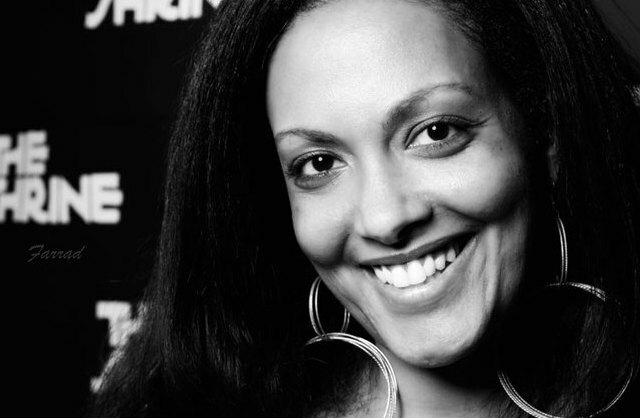 The Ethiopian-born artist moved to the U.S. when she was a toddler and grew up in the suburbs of D.C. After graduating from the University of Maryland where she double majored in English and Speech communication, Wayna worked for three years as a writer at the Clinton White House before launching her music career. Her debut album ‘Moments of Clarity’ was released in 2004. Five years later, she was nominated for Best Urban/Alternative Performance at the 2009 Grammy Awards. Wayna is currently back on tour and gearing up for another album. In honor of Billie Holiday’s birthday Wayna will be performing at the Blue Note in New York on April 6, 2012. Below is our Q & A with Wayna. Wayna: I most enjoy writing and performing when it’s in the zone — and by that I mean the moment when you lose yourself in what you’re doing and something special happens that’s beyond you. It’s like all your daily thought and effort at honing your craft goes out the window, and you really let go in front of a crowd or in a writing session, and something better than you comes out. It’s awesome. I usually don’t sleep after days like those. Wayna: My late aunt, Yeshie Immebet Emagnu. She was a real pioneer — one of the first women to graduate from Addis Ababa University and one of the first Ethiopian graduate students to come to the States on a scholarship at a time when very few women, Black people and/or immigrants were earning advanced degrees. They urged her to study Education, because that was one of the few programs acceptable for women at the time, but her interest was in Political Science. So without her funder knowing, she enrolled in both programs and completed two masters in the amount of time allotted for one. At the end of her studies, she had to fight for them to honor the second degree. I admire that self-determination, and all while being very young and very far away from your family and all that’s familiar. I hope she passed a little bit of that down to me. TADIAS: What challenges have you faced as a female artist? How did you cope? Wayna: Sometimes, people will welcome your opinions about vocals or what you’re going to wear, but not about which drum sound you want in the song or how you want the video edited. Because I’m executive producing my albums, I have to be involved in all kinds of decisions, and it was striking to me in the beginning how frequently people thought they could talk me out of my opinions or how often they assumed the good choices were someone else’s — something I don’t see a lot of male artists or producers encountering. In fact, it seems like women at every level of success in the industry still experience this, no matter how accomplished. So I had to learn very early on to trust my instincts and to not look for validation for everything. I more than welcome input, and I take advice that feels right, but at the end of the day, its my call, and I am comfortable with that and with accepting whatever comes as a result. TADIAS: What are some practical tips you can give for young females who want to follow in your footsteps? My best advice for young women pursuing music is to really find themselves personally and creatively and to figure out what absolutely unique thing it is they have to give, whether it’s the story they’re telling or something about their voice or their background or the way they play. Above all, it should be unique and honest. That takes experimentation and trying things out of the comfort zone, and not protecting our ego. You can’t grow and inspire anybody if you’re not willing to be vulnerable. So everyday try to give yourself the gift of imperfection and to dig a little deeper into who you are. It’s not easy, but it’s worth it, because at the end of the day, none of this is really even about how well we do what we do, it’s about who we’re become along the way. Wayna: I was born in Addis Ababa, I immigrated with my mom to the U.S. when I was a toddler and grew up in the suburbs of D.C. I graduated from University of Maryland and worked for 3 years as a writer in the Clinton White House. I stayed there because I felt like I owed it to my family, who made a lot of sacrifices to raise me in the States and give me the best opportunity at a stable life and “a real job.” But one thing I was always clear on, from as early as I can remember, was that I wanted to sing. It took a while before I was willing to risk disappointing my family to make music my main goal, but once I did, I found that it came as no surprise to anyone and that everybody was really excited and pulling for me. Wayna: My third album is the culmination of a tremendous amount of musical and self-exploration, coming off the biggest highs and challenges of my career and the birth of my daughter. I was determined to make something honest and unique, so I got out of my element and went to Toronto, where a friend had encouraged me to come and jam with some musicians. These guys were from all over the world and understood every genre of music from habesha to arabic to reggae to rock. A year later, we’re putting the finishing touches on the LP, ‘Freak Show,’ a blend of african and reggae-infused soul mixed with alternative rock. I am going to be offering some of these songs for free soon and playing them live at the Blue Note Friday April 6th at 12:30am, so please join us if you’re in NYC and/or follow me on Twitter @waynamusic or find me on Facebook, so you can hear and have the new material. I hope you love it as much as I do. TADIAS: Thank you so much and Happy Women’s History month from all of us at Tadias! Wayna: Thank you Tadias, for all your support over the years. Wayna you are paving de way for our generation singers, I appreciate you. Yeshie Immebet Emagnu my mother’s best friend. They were the same batch of women to graduate together they were classmates, way back in the day. I am not surprised you have turned out a success Wayna! Best wish on all your future endeavors my dear and good luck! I will be at the bule note. will not miss it for nothing! her aunt is not in google? so? everything is not in google. The thing that people seem to miss about not just Google, but also other search engines is that there’s an awful lot of communities that have never been served by traditional media to feed their information in to search engines. Now that Wayna has mentioned her late aunt Yeshie Immebet Emagnu in this great interview, I am certain the information is now available in google search engine. That’s the way these things work. Not every college record can be-found online. I was just going through your webiste and I noticed the cool quote on your cover page: “We are the ones we have been waiting for”!! I like that! Wayna is what Wayna wants to be. She is a real artist in an unbiased sense of that term. A real role-model for aspiring artists who lack support either from parents or community. She is a skillful writer and singer, I wish her all the best with full knowledge that she shines in these tasks. I had the pleasure of attending WAYNA’s concert last month at the Shrine in Chicago . As far as watching her live go, it was exciting because of all the electricity that is generated by her on stage. She got it! Wayna you are a Great role model and I wish you great success in everything you do in life. You are the Best!